This may be surprising to a good many of you out there, but spring is upon us. It’s time to put away those winter clothes (or so I’ve been told), and plant and mulch and fertilize and…oh yes, organize. Now before you go into panic mode thinking that I’m going to inspire you to do some spring cleaning, or you begin to feel overly confident that you’ve been organized since the plastic bins went on sale five years ago, let me remind you of that dirty little secret we share. 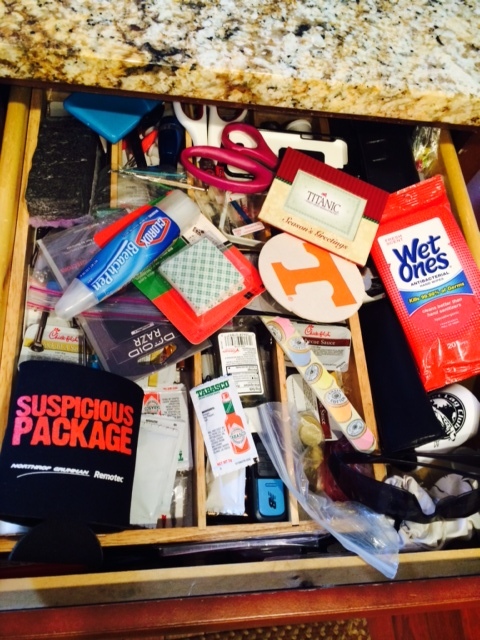 The junk drawer in our kitchens! You’re probably wondering how I know; you’ve kept it hidden for so long, but we are friends and friends stick together so chances are if I have one then you have one too. It’s okay to talk about it. In fact, I talk about it frequently with my husband. “Did you see what I did in the kitchen today?” I anxiously ask after two hours of cleaning and straightening. “On the shelf with the peanut butter and… pasta,” I say, wondering why peanuts together with pasta made sense before I said it aloud. Nonetheless, I’m feeling quite proud and accomplished. …And just like that, my bubble pops. “I’ll get it next time,” I say, but the truth is I won’t.I have always had a junk drawer and on a few occasions, I have had two. When my husband was in the Air Force, we moved every three or so years. The nice perks were having a moving company pack and haul all our belongings to our new location—free for us. Of course, there were down sides to this as well, but that’s another blog post. Normally, before the packers came to wrap all our stuff in paper and shove, I mean place it in boxes, we organized. This prevented us from finding five paperclips and two pennies wrapped in about ten sheets of paper—three months later. Yes, that really happens. My friend’s cat survived seven days saran wrapped into the couch. Imagine her surprise! I digress. By the time we sorted through an entire house, we just didn’t have the energy to face the dreaded junk drawer so it was inventoried, packed in a box, and moved under the assumption that we would sort it all out later. At the new house, it was dumped into a whole new drawer where it continued to thrive. Now, I have made peace with my junk drawer(s). It’s a love-hate relationship. It is the one place in our house that is “acceptable” to be in disarray. Our junk drawers are unique to who we are, where we are going, and where we have been. So I am going to share a little bit of me in the hopes that you will share a little bit of you and, together, maybe we can solve a few of life’s questions, like why does something you haven’t used in years suddenly becomes useful the day after you tossed it? Let’s begin with the bare necessities every junk drawer requires, I think. We have a miniature sewing kit because the big one is just, well, too big for everyday repairs. The fast and convenient packets of barbecue sauce, ketchup, and Tabasco, though the latter might fall in the rather unusual category but I LOVE Tabasco drizzled on rice, and since we have such a strong Asian connection in our home, these nifty packets travel quite well. There’s a bleach pen for stains, scissors, fingernail file, and Wet Ones that belong in the car. A bag of tacks, a coaster, an assortment of silverware, reading glasses, a digital pedometer that I don’t know how to work, hand sanitizer, and those tiny little screwdrivers that fit those tiny little screws. There are screen protectors for cell phones we don’t have anymore and a bag of foreign coins because you never know when you might need a few Euro or Yen. I could go on but I don’t want to bore you with a coozy that declares your drink is a “suspicious package” or a “jet lag club” bottle opener which, by the way, is pretty darn cool, we have another drawer to explore. If we didn’t find common ground in the fun drawer, maybe you are a little more technical. I have just the drawer. Tape measure, guitar strings, tuner, glue pen, a document that may be important, a water balloon nozzle, hooks, an assortment of scented oils, vinyl repair kit, wood putty, outlet plate, and a bag of Las Vegas casino chips. What? Whew, that was a lot of stuff. We may not have solved any problems, or cleaned out any drawers, but now you just might have a better understanding of the world in which I live. 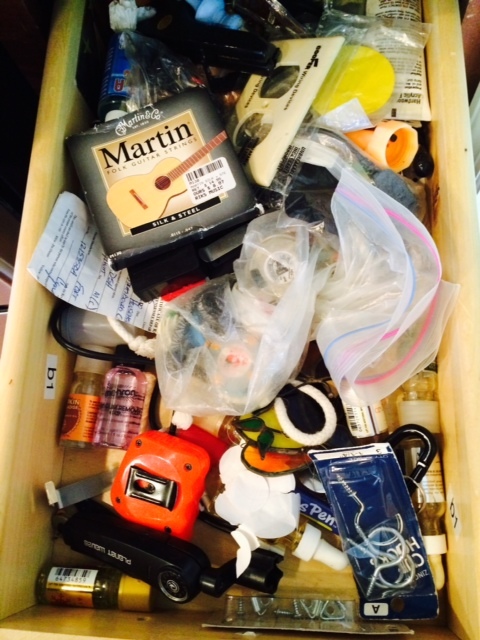 So come on and fess up, what’s in your junk drawer?